Three days ago, I stopped my story about Teshima’s Matsuri with a short video showing participants “fighting” a duel, Taikodai vs Mikoshi (the shrine being dedicated to Hachiman, god of war and strength among many other things, this showing of strength was more or less part of the ritual, but it’s purely fun dimension must not be neglected). Once they all made it to the bottom of the hill, they stopped for a few minutes, in order to take a short break and catch their breath after such an effort. We followed them and stood among them, taking pictures and laughing with them. 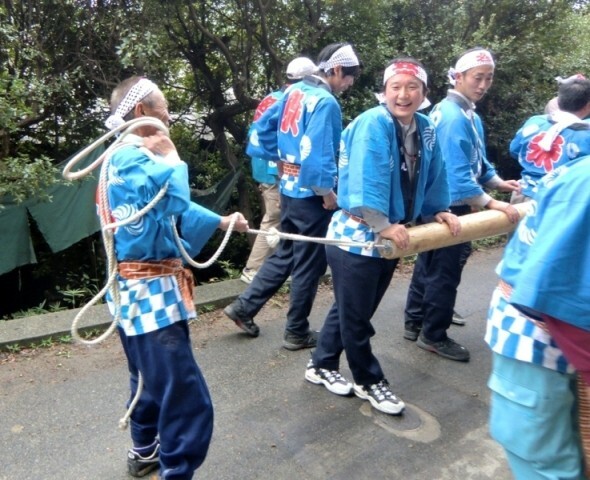 A short old guy (who was very short and who looked very old), whose job was to hold one of the Taikodai‘s ropes to help lead it in the right direction and who was already quite drunk, asked me jokingly to help him carry the Taikodai. So, I pretended to lift it and suddenly, before I could realize what was happening to me, I ended up with a Happi on my shoulders and that was it, I just had been “hired” as a Taikodai carrier!!! On the left, the little old man (sadly, we can't see his face). Laughing in the middle: Yamada-san whose Happi I was going to carry just seconds later. How can I describe this in details? The incredible effort it required to carry the Taikodai (I’m not exactly physically strong, and being much taller than the average Japanese man, it made it harder to carry the Taikodai beam on my shoulder). The intense communion with people I didn’t know five minutes earlier. It was an incredibly moving experience to suddenly feel as being part of such a group, even for just an hour or so. At times, I hated the language barrier between us. Some other times I felt that thanks to it, non-verbal communication had to take over and allowed a degree of empathy and unison that wouldn’t had been there if I spoke Japanese. Whatever it was, it was also a big blow to those clichés about the way Japanese people behave with foreigners. 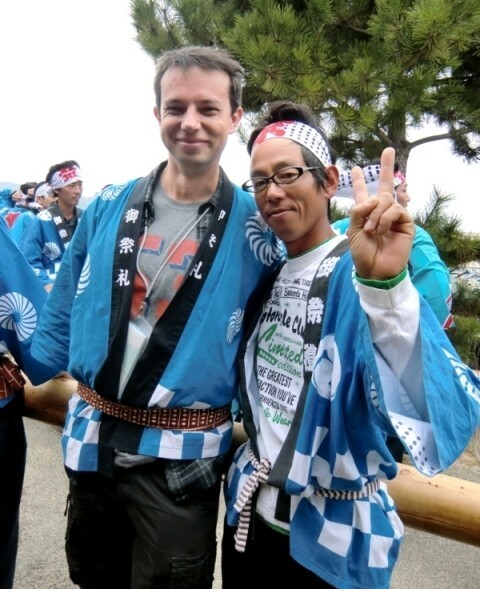 One of my "Taikodai-mate". Sadly, I don't his name. He was quite drunk. And I have to admit that despite the (early) hour, I indulged in a few beers, I had to. And that explains the silly face I have on this pic. Not everything was fun and games. There was a little accident. An old man had joined us halfway through. He positioned himself on the other beam, facing me. 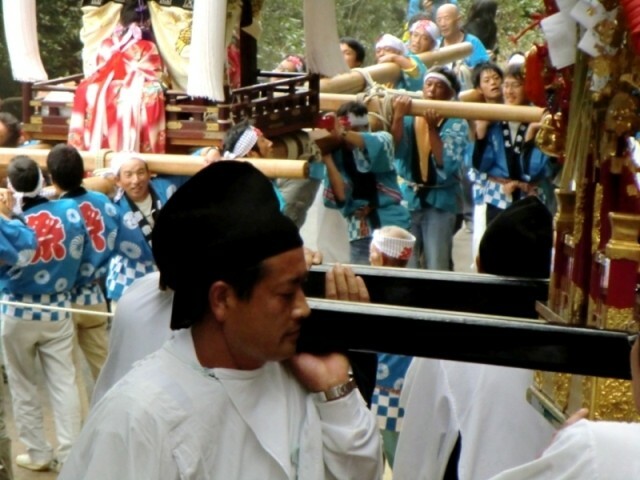 A few minutes after arriving to a small plaza, while we were turning and lifting the Taikodai in a similar fashion as what can be seen in the video, he suddenly fell to the ground and stopped moving! When the procession stopped and people started checking on the old man and help him, I naturally expected to be ignored. Actually, I almost excepted to hear “Alright, Furansujin, it’s over now. Can’t you see it’s serious? Go away and leave among ourselves!” or something like that. Strangely I felt responsible for the old man falling. Maybe I didn’t understand something that was being said to me? Maybe I didn’t do something right, and that’s why he fell? Of course, it was not my fault. He was old, it was too much effort for him. Maybe he had drank too much too, who knows? What happened next still surprises me and moves me to this day. An old women walked to 康代 (who was standing next to me at that moment) in order to reassure us! Yes, this old man was on the ground, unconscious, maybe dying, and this woman made a point in making sure we understood what was going on so that we didn’t get worried. I can’t believe that at this very moment when I really felt out of place, this woman came to reassure us. Not only we were not out of place in her eyes, but we really were a part of the group and needed to be informed of the situation! However, despite her saying that it was not serious, I’m not too sure that it was not serious. He was still alive – I had doubts at some point – but he didn’t get up, he was taken away on a makeshift stretcher. To this day, I don’t know if he was fine in the end or not. 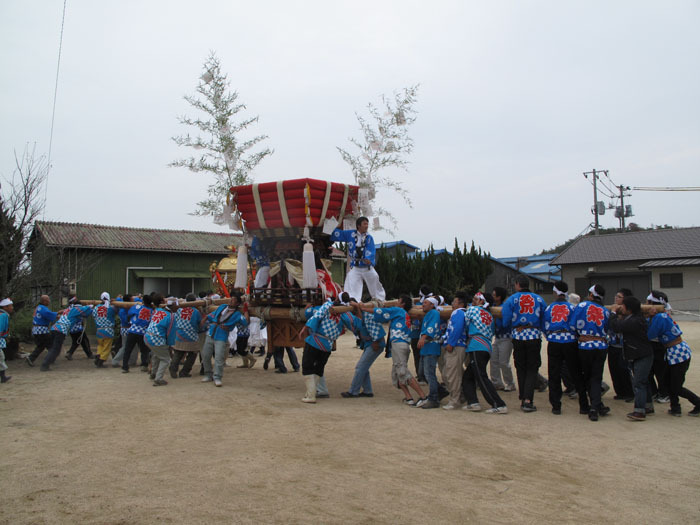 Shortly after, we all went back to carrying the Taikodai, but the incident had wiped us out of our energy and adrenaline – or at least mine. 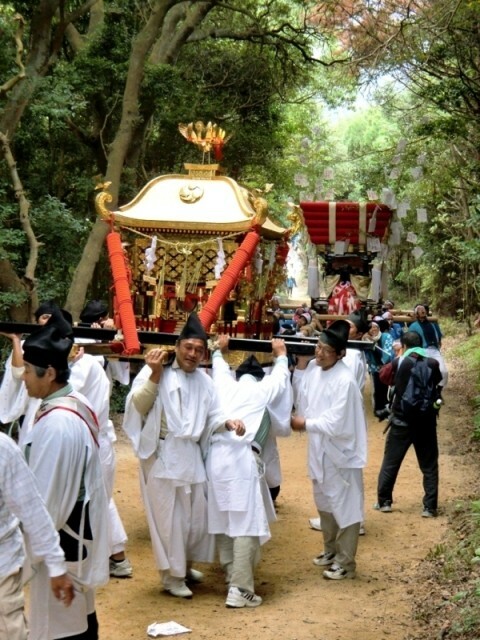 That last part was really hard, but soon we arrived in the center of Karato which was the end point of the procession. Exhausted may be a weak word to describe how I felt at that moment. Although, my physical state was not what mattered then, as it is gratitude that filled my heart at that moment. I will never be able to thank the people of Karato enough for allowing me to take part in such an experience, such an event that is so important in their culture and dear to their heart. 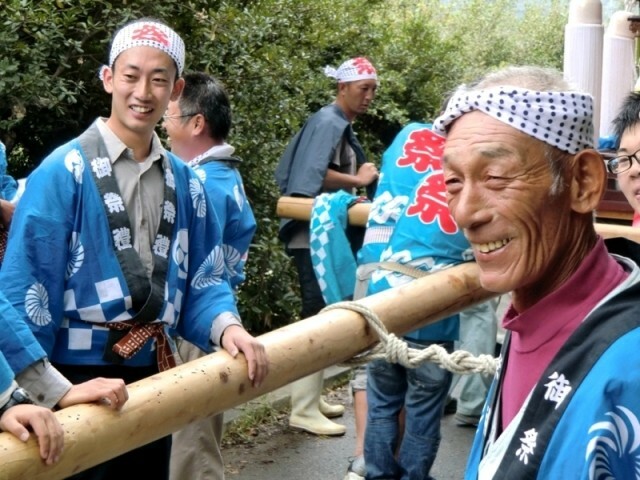 And while I should have thanked individually every single one of them, to my surprise, many of them came to me and thanked me for helping them carry the Taikodai, including two older men who most likely were some sort of Teshima dignitaries and for sure the Matsuri organizers. Later that day, I met the man on the right again in another part of the island. He ran to me to warmly thank me again for having been part of the Matsuri. You will have noticed the lack of pictures in this post, compared to what I’ve accustomed you to. Well, I couldn’t take any for obvious reasons, and 康代 was so worried about me while I was under the Taikodai, that she forgot to take any. Thankfully, there was also Aki – who visited the Festival with us. She managed to take a few. Can you find me on this one (it shouldn’t be too hard). Great story.I like this sentence. I think that the people of Teshima are the nicest people I’ve met in my life, not just in Japan, but of everywhere i’ve been. It is my understanding that it’s pretty hard too. Most of the people on these pictures are fishermen, and this is not a job I’d like to have.